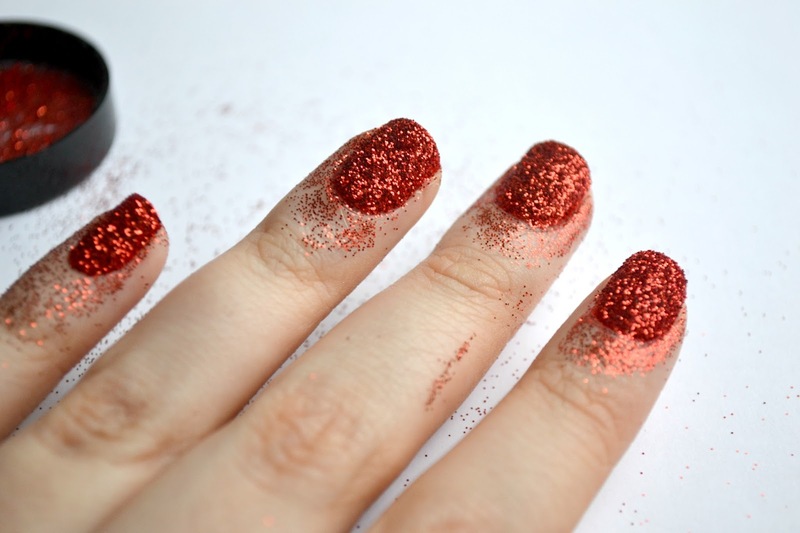 Today we're talking Nail Glitter. 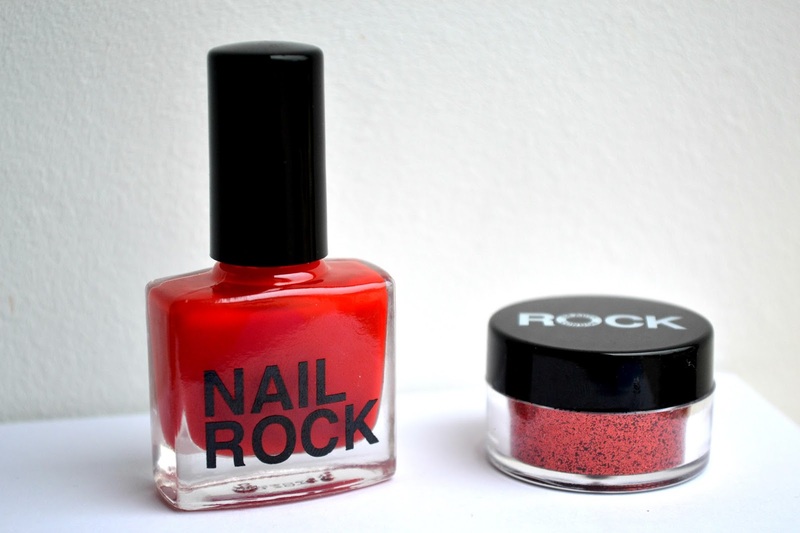 More specifically this 'Nail Rock Nail Glitter Manicure Glitter', which is quite a mouthful of a name. When my December Birchbox dropped through my front door I was immediately drawn to this, I love a good glittery nail and I wondered if this was going to eliminate the difficult and messy removal that glitter polishes have and convert me to dipping my nails in a pot of glitter. Looking back, that was a pretty foolish idea but we'll get to that. 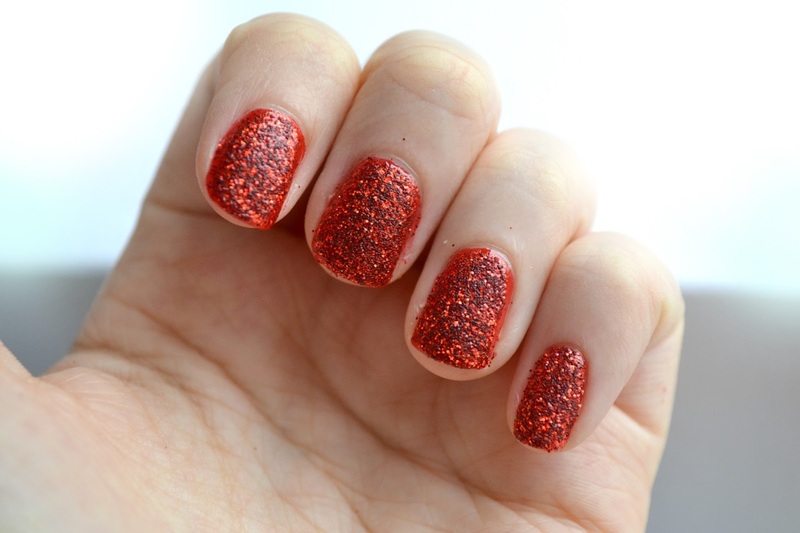 It looked like a pretty colour from the packaging, I've talked about my favourite red glitter polish here and whereas I'm not a fan of plain red manicures I think a bit of glitter makes it suit my pale hands much better so I find myself gravitating towards them. The set comes with a basic red polish that's a little on the orange side, and big old pot of glitter. The instructions were pretty basic; 'Paint your nails with two coats of the coordinating nail polish. Dip your nails into the pot of Nail Glitter and press firmly onto the coloured nails. Allow 15-20 minutes for nails to dry.' And Birchbox even provide a gif version you can see here. So I did. I painted on two coats, I dipped the wet polish into the glitter, and it looked promising! This is what the damage was after I did one whole hand. They show you someone brushing off the glitter but don't provide a brush so I ended up using that Real Techniques duo fibre eye brush that's scratchy as hell but it did the job. If the job was getting all that glitter that was on my fingers onto my desk and all over me. I was left with a bit of a mess! Once I was finally finished I looked at my nails and realised it was a massive waste of time. There was no glitter round the edges even after I dunked my nails in the pot like they showed and it drank up all the topcoat I put on and was still rough to the touch. 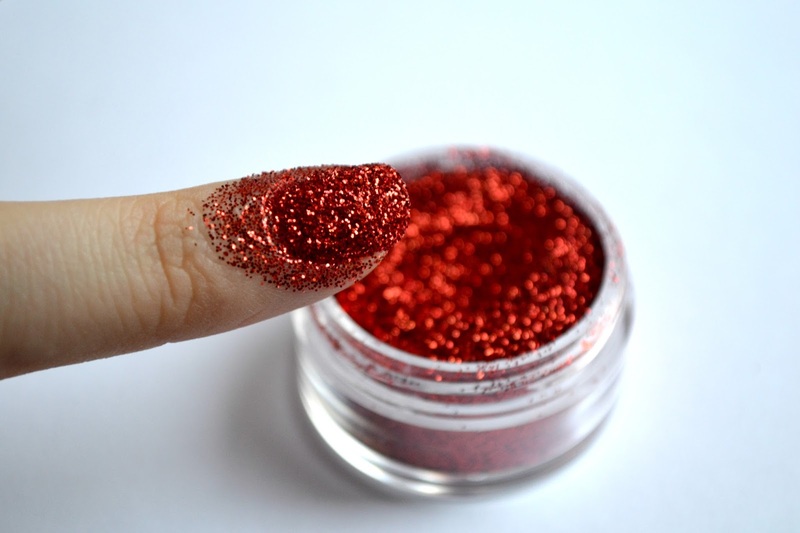 And today I realised something, this is exactly the colour of Barry M's red glitter polish. Except that never made me have glitter everywhere, I like glitter, just not randomly on my face three days later. Removal was pretty unpleasant too, just like a normal glitter really except it spread out more and got all over my fingers. Normally I try and think of a situation where this would be a good product and I pondered if for a while but there just isn't one. 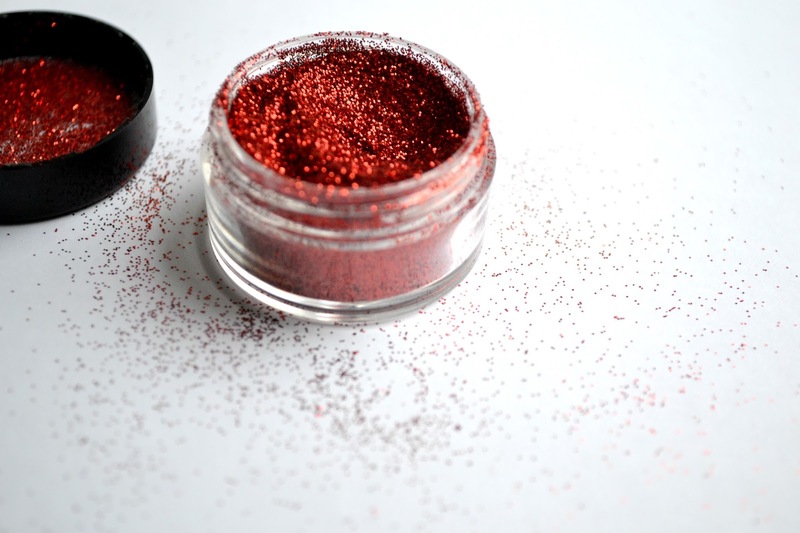 If you want a good pure red glitter in a clear base that gives amazing coverage buy the Barry M Red Glitter (#150). If you did want to try this, you can get it from Birchbox for £6.99 here, and the Pink and Navy versions are on sale from Claire's for £4 each. 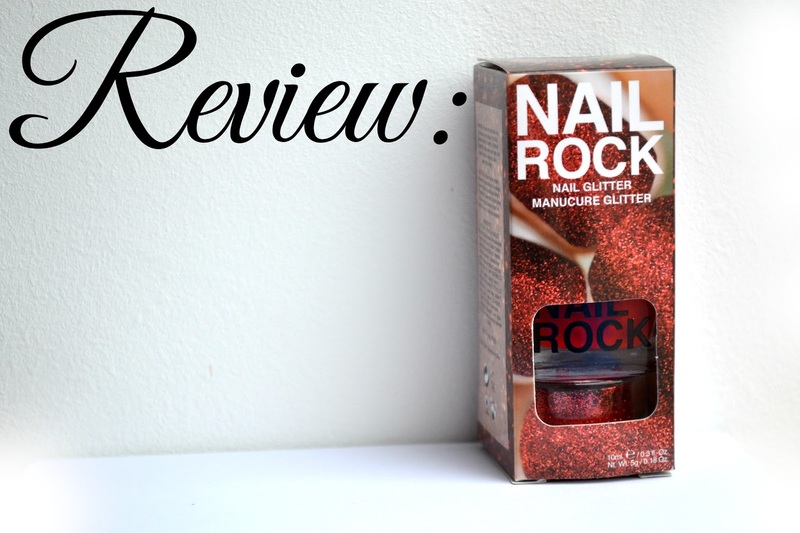 Have you tried Nail Rock's Nail Glitter Manicure Glitter? What do you think? I've used it twice (got in a monthly Birch Box) and never had an issue with the sides of the nails and coverage =/ Maybe it's because of the brush you used being too rough on it? I just did the dunk in glitter, then I tapped my finger a couple times to get off as much excess as possible, then I used my finger to slightly press on the glitter just to make sure it was set in the polish and used another nail to grab any of the little extra if I painted over the side of my nail accidentally. I used a top coat to try to let it set better, but I didn't get a huge mess or any problems with covering everything. I think it is definitely worth a second chance! Review: Lush's French Kiss Bubble Bar.